This year I am again offering a PiF. 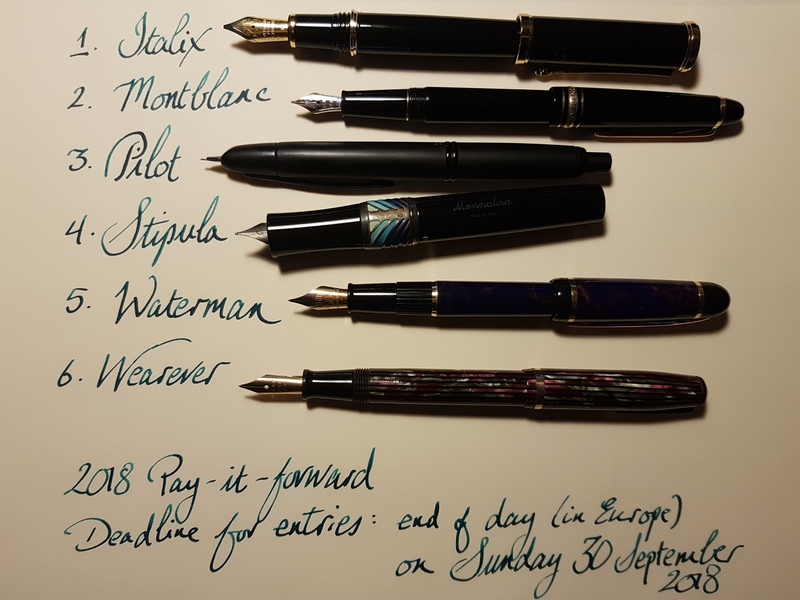 My 2018 PiF includes six fountain pens, one for each of six winners. ITALIX. Churchman’s Prescriptor. Steel Medium Italic nib; Cartridge/converter pen; no converter included. Screw-cap. MONTBLANC. Model 145, I think. 14k nib (I bought it as a Medium). Modern cartridge/converter pen. I bought this in filthy condition and although I have been able to clean it up somewhat and get it writing, the converter is stuck in the pen and I have never been able to remove it. Screw-cap. PILOT. Vanishing point/capless. 18k Medium nib. Black body & clip. Comes with a converter (whatever came with the pen; I think it’s the CON-50). STIPULA. Monnalisa, with titanium nib. This has a retractable nib. Cartridge only, due to twisting mechanism (I don’t think any converter would fit). Shown in the photo with partly-extended nib to show mechanism. WATERMAN. Phileas (that’s what I bought it as). Medium steel nib. Cartridge/converter pen; no converter included. Snap-cap. WEAREVER. Pacemaker (I think: barrel engraving is well-worn, so it’s hard to read). Steel nib (F or EF) and transparent feed. The inner lining of the cap is present, but loose. Button-filler. Screw-cap. Anyone who has not previously won a PiF from me may enter. You may only make one entry, for one pen: anyone making more than one entry will be disqualified. To enter, respond on this thread, confirming that you have read the conditions and notes, and saying which of the pens you want. I’ll then put you onto the appropriate list. Deadline for entries is 23:59 on Sunday 30 September 2018, Central European Time (i.e. 17h59 on the US East Coast). I may bump this a few times before the deadline. As soon as I can after the closing date (work and other commitments permitting), I’ll draw the six winners at random and inform the winners on this thread. Winners will have a week to confirm via PM that they still want the pen; we can work out specific details thereafter. Once the details are sorted, I’ll post out the pens. I won’t commit to a specific time-frame on this, except to say that I’ll do it as soon as I can. keeping the pen, giving it away or swapping it (not selling it). posting a picture of a writing sample on this thread once you have received your pen. I shall pay standard postage to anywhere in the world. If you want any extras (e.g., insurance, courier), you will need to cover the postage costs. I shall send the pens from within the European Union. If you live outside the EU, I will have to fill out a customs form: I'll label your pen a gift, but also declare a reasonable value. You may have to pay customs, import duty and/or other fees. Any such payments are your own responsibility. I reserve the right to close the PiF early for any or all of the pens if the number of entries becomes too large. If you have a gazillion pens already, please think twice before entering (and maybe be prepared to offer one of your existing pens of a similar value as a PiF if you win). These are rather nice pens: why am I giving them away? I have spent the last few years enjoying working out what I particularly like in a fountain pen. I liked these pens well enough to buy them, but in practice I don’t like them enough to really use them. For example, the Pilot writes beautifully, but I just cannot befriend the clip. I could sell them, but I want to give something back to the community that has given me so much pleasure and information over the years. Finally, I make no guarantee about the performance of any of these pens. All I can say is that they each worked fine the last time I used them, cleaned them and put them away. Not an entrant, but thank you for your generosity. Hello. I have read the conditions and notes. Please put my name for the Pilot VP as I have someone in mind to give it to who does not use this forum. Not an entry. Just wanted to say thank you for the generosity. Great PIF. I have read the conditions and notes and accept. I would like to put my name in for the stipula on behalf of a friend. Thanks. Edited by Bold2013, 29 August 2018 - 00:54. Hello. I have read the conditions and notes, and would like to put my name in for the Pilot VP. Thank you for your generosity. Howdy. I have read your terms and agree. I'd like to be included for the Montblanc 145. Mighty generous offers you've made here. Thank ya kindly. Not an entrant myself, but I'd just like to acknowledge your astonishing generosity, stephanos. I love Pilot Vanishing Point pens myself (especially the matt black, which is my EDC), and between my fiancée and me we have ten of them; I'm sorry to hear that yours doesn't wholly agree with you. I don't think I can deal with writing with a Pilot VP Medium nib, though; I had to swap one out and order a Fine nib as a spare part to use in its stead. Not an entry, but THANK YOU! Fabulous PIF! Read and agreed to condition. Entry is to give the pen to a coworker - MB 145. It's an amazing act of generosity! Please put my name down for the Stipula (read the conditions). I've always wanted to try a titanium nib! Thank you. Fanfics: Tales of love, sacrifice, and sushi. Great pay it forward, thank you for your generosity. I have read and accept the terms and conditions. I'd like to be added for the Montblanc 145. But, not anymore. I am disqualified by owning a gazillion pens, most of them eyedropper-filled and lightweight. But I do love the idea of such a sweeping and generous PIF, and will think of a suitable way to give away some of my nicer unused ones this year, in addition to the piston filler demonstrators that are handed out to students for their fountain pen physics assignment. So thanks! and I hope your pens get to deserving new homes. Thank you so much for your generous PIF. I accept and would love to be included in the draw for the Waterman Phileas. I have an Etalon gold nib waiting for a Phileas section to live in. 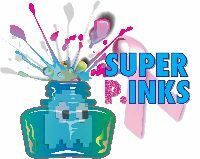 WOW what an amazing PiF! Read the conditions and notes (and will comply). I would really like to surprise my wife with the Stipula. Wonderfully Pif. I have read all the conditions and notes. Please put me down for the pilot vp. I just got into the fountain pen hobby and I'm amazed at how generous and welcoming this community is. Keep up the good work and thank you! Having read and agreed to the stated terms, I would very much like to put my name in forward for the Wearever. Whether I will be a lucky winner or not I would just like to thank you for spreading good cheer on the internet like this! The Pay-It-Forward Project Has A New Website! Let Us Know Your Thoughts!